So … I regularly get approached to speak at a lot of corporate leadership meetings …. and have done so for organizations like Johnson & Johnson, The GAP, Dupont, BASF, Siemens, Lockheed Martin. I frame for them the issue that the future is arriving faster than they think, and offer concise guidance on key trends that they need to align themselves to…..
To help emphasize the issue of the era of acceleration I’ve been using the story of the Jetson’s over the last 5 years while on stage. Remember it? It’s that cartoon show from 1962, purporting to show what the world will look like in 2062. Remember George Jetson? Remember the fact that there were autonomous vehicles, robot assistants, drones, and Skype and FaceTime seemed to be everywhere? Now consider this! About a month ago, I was approached by Arconic to headline a leadership meeting for them in Phoenix; this is a newly spun-off entity from Alcoa that is focused on advanced technologies. I’ll be the opening kickoff – outlining and reaffirming the trends that will provide massive opportunity in the future. Great minds think alike! They think the world of the Jetson’s is going to arrive here soon too — and are planning to play a major role in helping to make it happen. So much so, that they engaged Hollywood filmmaker Justin Lin of Star Trek Beyond fame, to do a live-action re-imagination of the world of “The Jetsons! Do you need to accelerate your team into the future? Do it now, and read my keynote topic, The Jetson’s Have Arrived Fifty Years Early: What Are You Going to Do About It? This is all just too much fun — just yesterday, while in Washington, I had some time to kill before a meeting, so I visited the Smithsonian Institution. 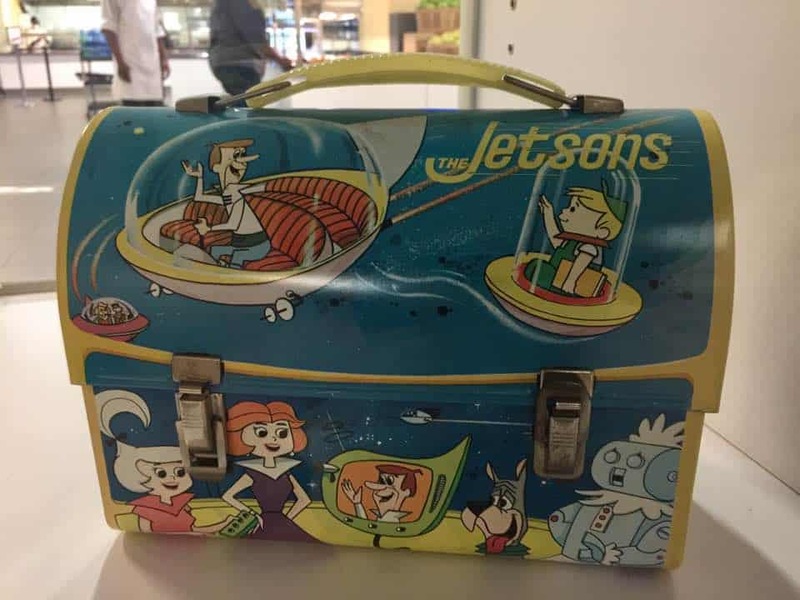 What did I find, but a Jetsons lunchbox! Here I am on stage in front of 2,000 in Chicago on the Jetsons!